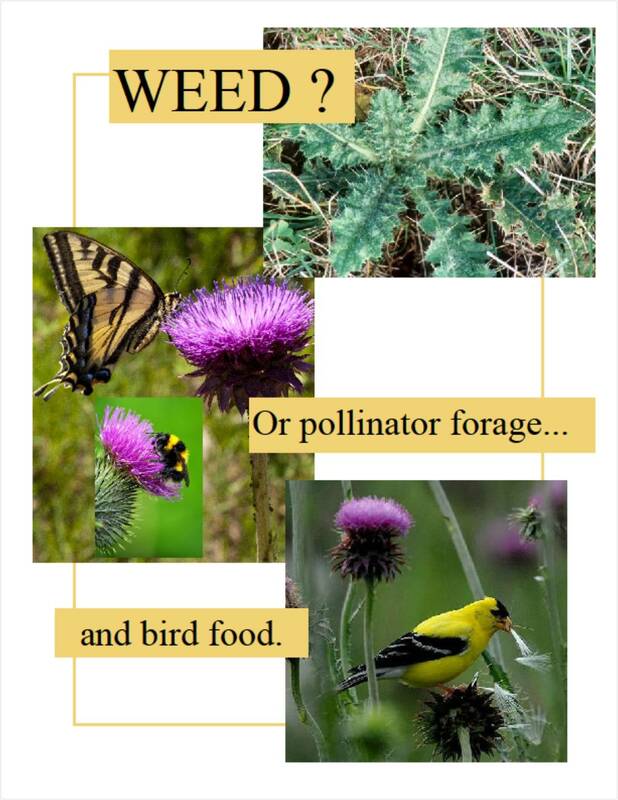 A Dilemma: “Weed” or Pollinators’ Best Friend? No, this poster is not an advertisement to plant more thistles! As part of a class on the need for pollinator habitat, it provoked questions and the rethinking of some old ideas. A patch of any kind of flowers covered with bees and butterflies is a bit like a soda fountain or candy counter jammed with kids. Pollinators choose flowers that are close by, abundant, and shaped so their tongues can reach the rich reward inside—nectar! 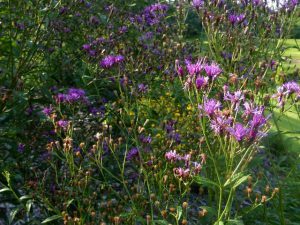 Flowering weeds—what we gardeners sometimes define as a “plant out of place”—fit all these requirements. And so, pollinators discovered the virtues of flowering weeds millennia ago. 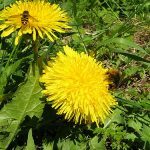 Maybe it’s time to take a new look at your lawn and garden weeds, through the lens of these creatures who are responsible for so many of the fruits, vegetables, nuts, seeds, and oils we eat. 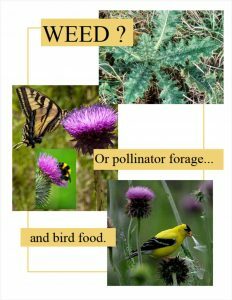 Maybe you, too, will discover the virtues of weeds already valued by our pollinators. All 4000 native bee species, as well as imported honey bees, depend on flowers for food! They get carbohydrates from the sugary nectars and proteins and fats from flower pollen. Moths and butterflies also require the foliage of specific host plants, in addition to their flowers, to provide food for their hatched butterfly and moth eggs. With the arrival of spring, early-emerging solitary bees, such as the mason bees, go to work pollinating berries and tree fruits. Mated bumble bee queens are coming out of hibernation to begin nest construction and egg laying. Perennial honey bee colonies build up their populations from the 10,000-strong winter clusters to mighty summer-foraging forces of 50,000 or more! 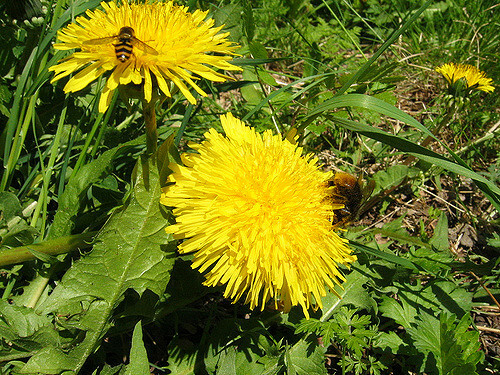 Many winter- and early spring-flowering weeds provide these pollinators much-needed food when little else is in bloom. 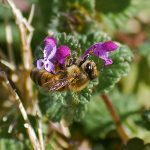 Purple deadnettle (Lamium purpureum), henbit (Lamium amplexicaule), and dandelion (Taraxacum officinale), for example, are important nectar and pollen sources. 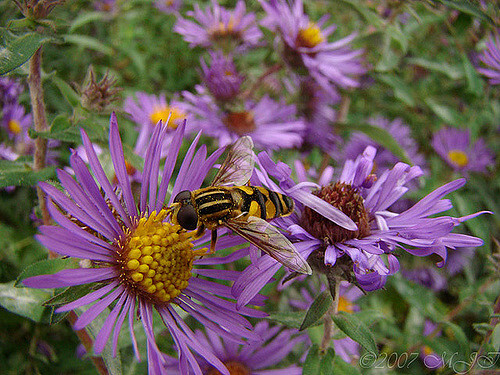 Fall is an equally busy feeding time for our pollinators. Wasps and hornets seem to know that their nests will soon be empty. Bumble bees are rearing queens. Honey bees are filling hives with honey they will need to survive the winter. They’re also rearing important winter bees with special fat body glands that are repositories of nutrition for babies that will hatch after the winter solstice. Fall-blooming asters (Symphotrichum spp. ), goldenrods (Solidago spp. 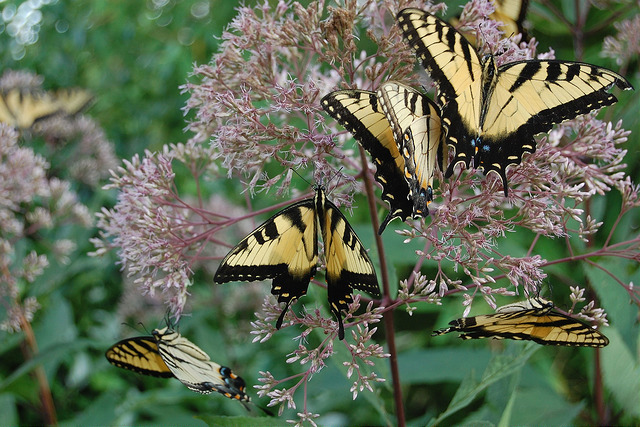 ), Joe Pye weed (Eutrochium ssp. 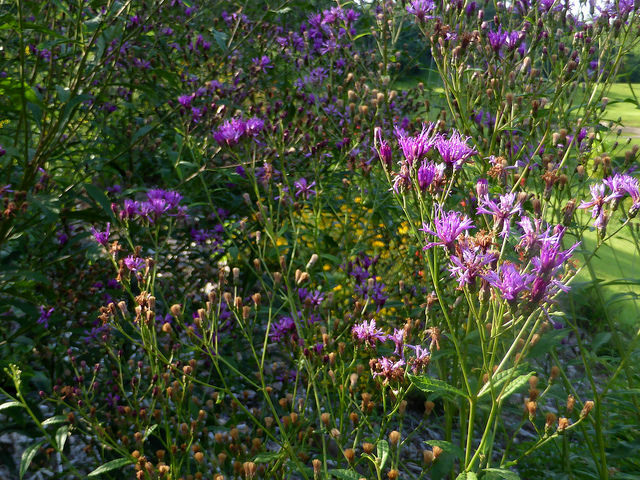 ), and ironweed (Vernonia, spp. 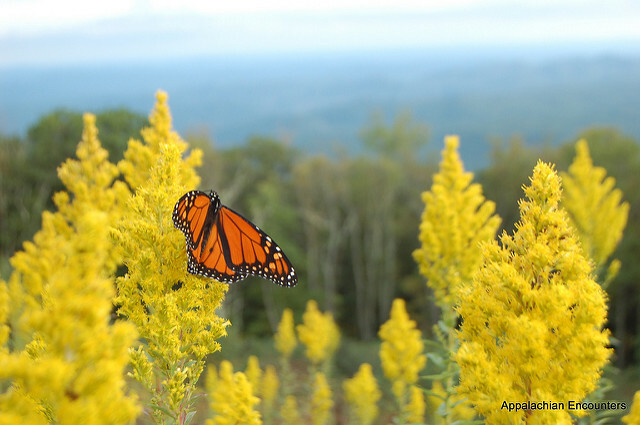 )—all native plants that are often treated as weeds—provide significant staples at a time of frantic pollinator feeding when other blooming plants are in short supply. 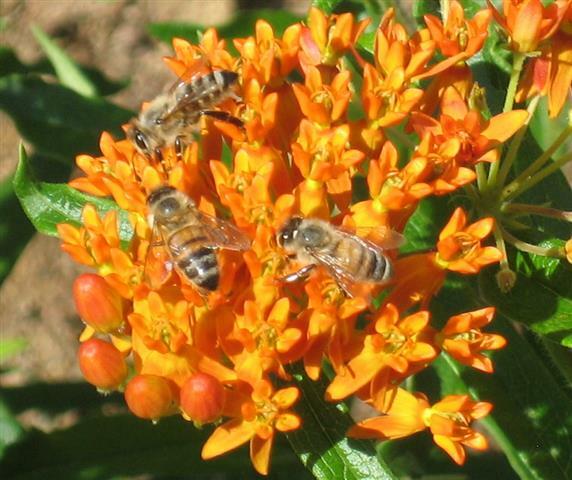 Ironically, the plants with “weed” in their common names, milkweed and butterfly weed (Asclepias spp. and A. tuberosa), are the essential host plants required for Monarch butterfly reproduction. But, the foliage of butterfly bush (Buddleia spp.) is of no value to any moth or butterfly in the United States. 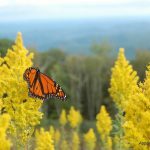 Yes, butterfly bush flowers provide nectar, but the plants escape our landscapes and show up unbidden in the wild as plants out of place! 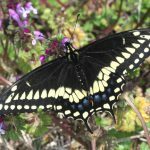 Is your landscape a food desert to pollinators? Or does it include a smorgasbord of useful, attractive flowering plants? 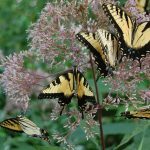 Adding native flowering annuals, perennials, vines, shrubs, and trees to your yard will provide foliage for butterfly and moth larvae, as well as flowers for all pollinators. In your lawn, white clover (Trifolium repens) blooms provide nectar in summer (and as a bonus, clover along with your grass clippings may put enough nitrogen back into the soil to fertilize your lawn). Richard Orlando, in Weeds in the Urban Landscape: Where They Come From, Why They’re Here, and How to Live with Them, notes that other low-growing flowering plants, such as thymes (Thymus spp.) and self-heal (Prunella vulgaris), are lovely and useful additions to a grass lawn. No one can—or should—tell you which plants are weeds and which are not. Of the uninvited guest plants in your yard, you decide: stay or go? Plants such as the early spring weeds can stay but not be allowed go to seed. Some may get to grow at the edge of the lawn. Some may be treasured native plants. 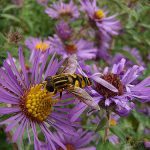 Gardening for Pollinator Super Heroes! Orlando, Richard. Weeds in the Urban Landscape: Where They Come From, Why They’re Here, and How to Live with Them. Berkeley: North Atlantic Books, 2018. 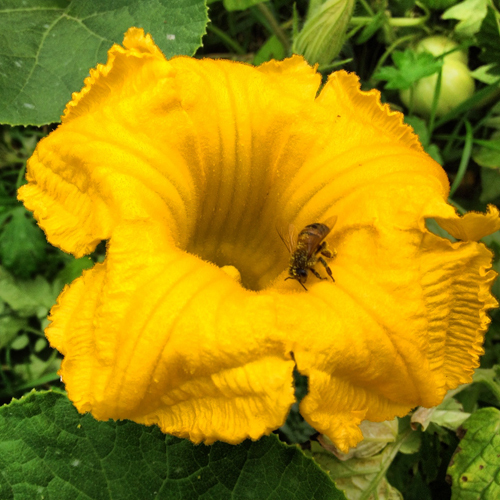 Pollinators and Your Vegetable Garden: A Win-Win Deal! Have you heard news reports that bees—especially honey bees—are in trouble? Media coverage often explains the vital role that bees play in our food production, attributing “every third bite” to these industrious creatures! There is so much more to know—and you can observe much of it in your own vegetable garden. So, what is pollination? Plants, like animals, share a single purpose: to reproduce and create the next generation of their species. Unlike animals, plants cannot go in search of mates, so they need the help of pollinators to move pollen from the male part (anthers) of their flowers to the female parts (stigmas). Pollination is the first step in plants’ reproductive cycles, which ends with seeds that contain the makings of new life—the next generation! So, what does the bee get out of this deal? While the wind, other insects, and even mammals, such as bats pollinate some plants, bees are the most well-known because they feed only on flowers. Yes, bees are vegetarians! They get carbohydrates from nectar and protein and lipids (fats) from pollen. Plants often produce nectar (the sugary syrup that plants make to bait pollinators) at the base of their flowers where pollinators must brush against the pollen-laden anthers and then inadvertently transfer it to a sticky stigma. But bees are not accidental pollinators. They forage for protein, carrying it either in the pollen baskets on their rear legs or in the scopa beneath their abdomens. And, what do WE get out of this pollination deal? That’s easy: fresh, delicious, and nutritious food. And more than the food, we also gain an understanding and appreciation for nature’s beauty and complexity with real hands-on learning. Watch a squash bee stir early one morning after overnighting at the base of a bright golden flower on your pumpkin vine. See and hear a big fuzzy bumble bee grasp a tomato blossom, vibrate her wing muscles to generate buzzing at the perfect frequency to cause that plant’s anthers to release its pollen. Notice how the ground-nesting bumble bees and Southeastern blueberry bees pollinate blueberries, while the honey bee and the carpenter bee cut slits in the blueberry blossom petals to rob the nectar without touching the pollen! Knowing more about pollination can help make you a more successful gardener and a better steward of the land. Early on, I learned that nature has many solutions to insect problems. My father, an entomologist, and grandfather, a horticulturalist, used chemicals only when all else failed—a philosophy that flew in the face of America’s love affair with pesticides in the 1960s. Today we call this approach to gardening Integrated Pest Management (IPM). North Carolina State University’s (NCSU) Extension Gardener Handbook defines biological management as “the process of reducing a pest population by using predators, parasitoids (often called parasites), or disease organisms that ordinarily occur in nature.” Why? Because in the great web of life, plant-feeding insects are food for other insects. Sounds good, but how does the home gardener know which beneficial insects to encourage? Good places to start are the Buncombe County Extension Master GardenerSM Volunteers Helpline (828-255-5522) and NCSU’s Cooperative Extension website. 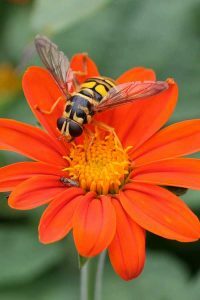 Common beneficial predators in western North Carolina gardens include: ground beetles, ladybird beetles, lacewings, wheel bugs, hoverflies, and predatory mites. These active insects have long life-cycles and prey on smaller, weaker insects, usually devouring them in one gulp. According to the University of Florida’s Entomology Department, the name of these familiar red and black insects “has been used in England for more than 600 years…The lady for whom they were named was the Virgin Mary, and common names in other European languages have the same association (the German name Marienkafer translates to Marybeetle or ladybeetle).” How can the ladybird better help your garden? Some of the pests they help control include aphids, scales, whiteflies, and mites. 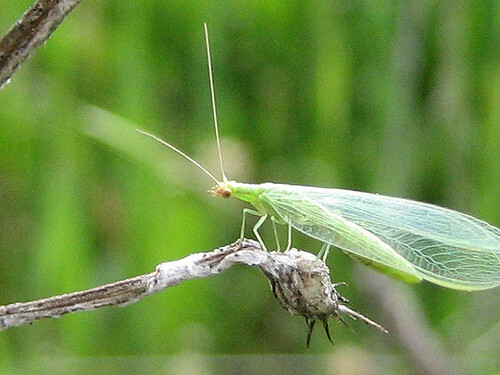 Lacewings are distinguished by roof-like, transparent wings that are held over the insect’s body. Known as “aphid lions,” the larvae of the lacewing emerge hungry and voraciously feed on aphids and other soft-bodied insects, such as mealybugs, scales, thrips, whiteflies, spider mites, leafhopper nymphs, and caterpillar eggs. 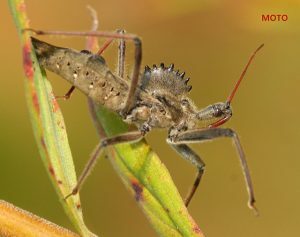 According to Michigan State University, “natural control of aphids is possible when there is one (lacewing) larva per 70 aphids.” Not bad for an insect that grows to just a half-inch long! 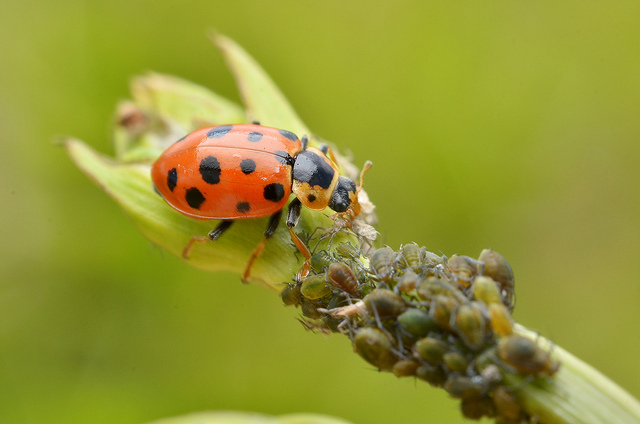 These beneficial insects are particularly sensitive to pesticides, however! We know them as those sinister-looking, long-snouted, brown insects that appear in great numbers each spring, often in places where we don’t want them, like our homes and cars. One place we do want them is in the garden. These predators prefer dining on soft-bodied insects such as caterpillars, moths, aphids, and small beetles. Wheel bugs are not aggressive, but they can give you a painful bite if handled improperly. If you have to pick one up, use a paper towel to gently remove it to the great outdoors where it can protect your garden. They look like wasps but they’re really flies. The name—hover fly—comes from the way they hang in the air during flight. 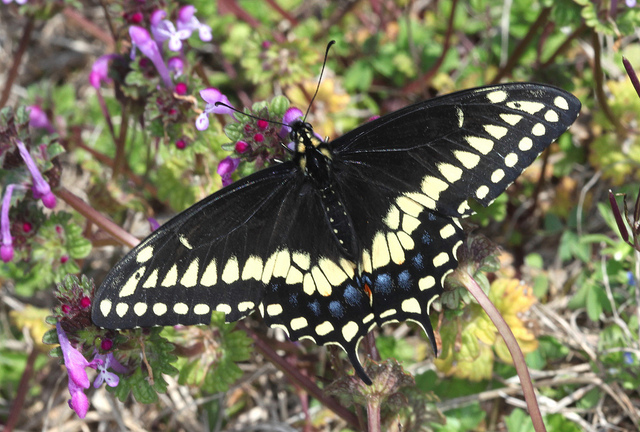 In their adult form, they are pollinators. In their larval form, they are predators. The larvae are often found among aphid colonies, one of their favorite foods. These doubly beneficial insects are sensitive to several broad-spectrum pesticides, especially organophosphates (OP) such as parathion and malathion. 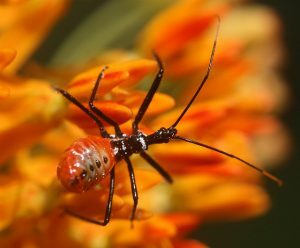 Want to attract beneficial insects? An important key is to plant so that there are blooms year-round in the garden. Opt for native plants that flower and include both flowering annuals and perennials to feed beneficial insects.